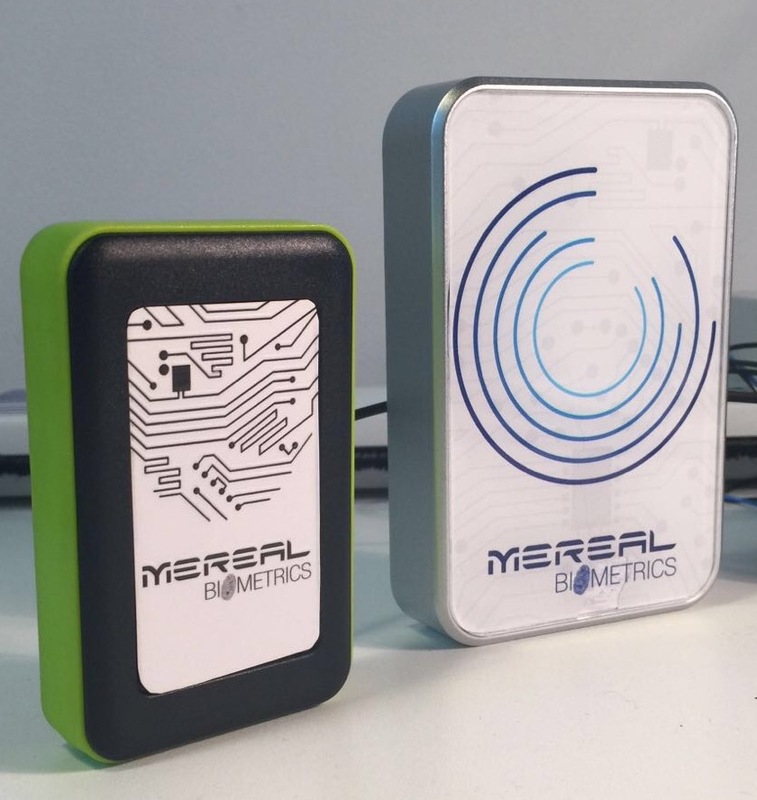 MeReal Cards and Card Products work together to bring the world the cutting edge in personal security, access, and data authentication. Once a fingerprint match is made, the card is activated along with the range of technologies on the card to suit any scenario. The card emits unique RFID and Acoustic one-time passwords directly to software on a device or over the world’s 9 billion telephone lines, and this Acoustic is the major differentiator when compared to anything else on the market. After a very short period of time the card powers down. The battery on the card can recharge using energy-harvesting technology so each time it comes in contact with an NFC reader it receives a charge. Plus, the card comes with an optional portable charger so users can charge at home, or on the go, every 2-3 months, or longer. With so much technology on one card… biometrics, acoustic, RFID, NFC, EMV, and harvesting technology, this card is truly universal and highly disruptive. It can be used ANYTIME, ANYWHERE, ANYPLACE and on ANY DEVICE. Version 2.1 is in production and available for purchase. It was launched in June 2017. The speed and accuracy of the sensor is key and this contact/ contactless version recognises the user’s finger instantly. 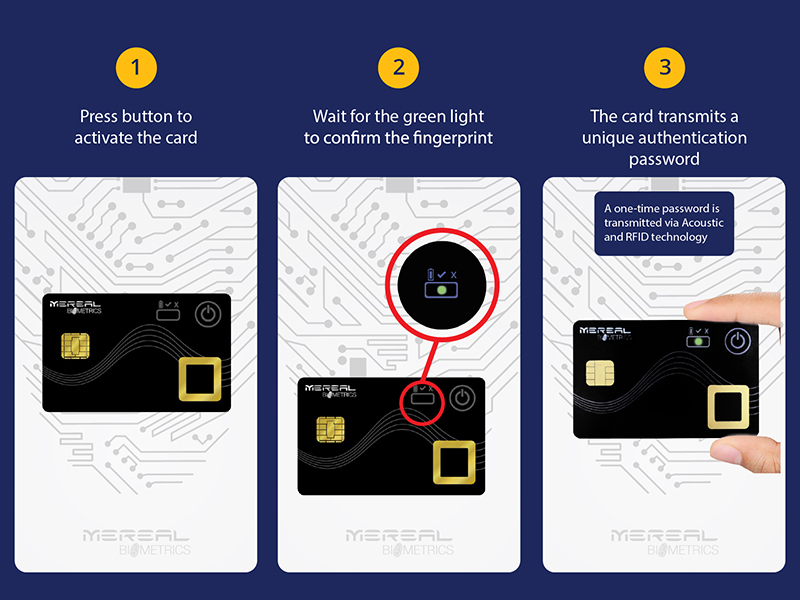 To ensure this multi-application card is the best, the research and development team at MeReal Biometrics searches the world for the fastest, smallest, most flexible, durable and optimal components available. Version 2.2 is in the making. “Tap” or “wave” this card at a payment terminal or access terminal, or down any of the world’s 9 billion phone lines, on a tablet or laptop or at any fixed terminal and watch it recognise the fingerprint instantly and authenticate you, the user. After a very short period of time, the card powers down. The card has a battery inside it and it comes with a portable charger using patented, energy-harvesting technology. With so much technology on one card… biometrics, acoustic, RFID, NFC, EMV and energy-harvesting technology this card is truly universal and highly disruptive. It can be used ANYTIME, ANYWHERE, ANYPLACE on ANY DEVICE. Never get caught without power. Even though the card is constantly harvesting a charge with each use, with so much ground-breaking technology onboard, the card will run low on charge occasionally. The MeReal portable charger is your safety net so your card continues to work, always protects and makes life easier… ANYTIME, ANYWHERE, ANYPLACE. Open the door to a new world of Biometrics-enabled Access technology. Ideal for Offices, Hotels, and even Private Residences, the MeReal Access Reader allows complete and real-time control over who can enter, where and when. Not just limited to Physical Access, Logical Access configurations and protocols can be used for identification, authentication, authorisation, and accountability in data security and computer information systems. Never get caught without power. Even though the card is constantly harvesting a charge with each use, with so much ground-breaking technology onboard, the card will run low on charge occasionally. The MeReal portable charger is your safety net so your card continues to work always protects and makes life easier… ANYTIME, ANYWHERE, ANYPLACE.